Apologies for the rushed entry earlier. Suddenly an evil slime overlod stormed our office and we had to go fend it off! He kinda looked like this by the way. Quite the scary fellow huh! Regardless, now that things have calmed down, Aldo suggested I should actually tell you guys how we plan to bring monsters to you and what you can expect from us. Let’s get to it! Every Tuesday, we’ll pay Yanfly and FlyingDream a visit and unveil together the thematic season which will rule releases for the rest of the week! Starting from that day onwards, Daily, we will release 3 monsters accordingly! Every Two weeks , on tuesday announcements, a sideview animated monster or hero will be released! Daily through twitter, WIP shots and updates will be published! Pretty simple huh? (◕‿‿◕)♡ Now some interesting tidbits regarding our monsters and battlers to look forward to! 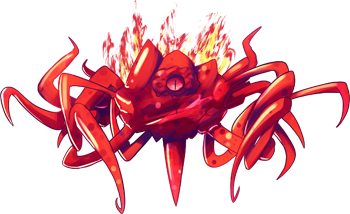 Ækashics monsters come in three ranks of power, and their look gets increasingly menacing or less threatening! For each release the Monster rank, size and type will be established, so that you can have an idea of what you’re working with and will get to work with eventually! Ækashics, or Justice, whichever you prefer; I would like to say that I am truly happy to make your acquaintance and want to welcome you and your amazing-ness! Also that evil slime overlord looks absolutely amazing! I love it! Also may I say, your “sprite” or the one to represent you is absolutely adorable!! Thank you for your awe-inspiring artistic presence! Thank you very much! It may even be released along other surprises in the future. We’re still accomodating things around these parts so excuse the mess in our website for now! This is a really awesome initiative. Thank you! Can you confirm whether or not you intend to release 3×4 sprites along with your battlers? For those of us who like to have conversations with monsters. Sadly not for now since there are plans for daily releases and bi-monthly animated releases, but it’s not ruled out for the future! What exactly do you mean by “creatures Aldo,Yanfly and I have all fought in the past”? Just what kind of backstory do you guys have? That is a story we’ll get to tell one day (◕‿‿◕)♡ ! Everything is so aggressively cute! I totally approve! Wow ! your art is just really incredible! I can’t wait to see what sort of magic you will do for all our great rpg. The generosity of the people in this community as simply staggering! Saying thank you for providing such amazing art, just doesn’t seem like enough, but as I don’t know what else to say, thank you, thank you so very much! Your art is absolutely adorable and I can’t wait to see more! I’m using your art already in my game, is just so cute and awesomes (my favorites ones for now, Fairy Dragon and Kawabun ♥), waiting for seeing more, thanks for all your hard work! RPG Maker MV is becoming something big !